You are currently browsing the tag archive for the ‘tools’ tag. The Shimpo Aspire Tabletop Pottery Wheel. This little wheel weighs 25 pounds, goes on a tabletop, and is supposed to center 20 lbs. Yeah right. Looks like a toy doesn’t it? Well I tried it out and here it is. No toy. I don’t remember how much clay I used, but the pot stands 13 1/4″ tall. Not bad. Like any Shimpo I’ve used, (and despite the fact that this one is belt driven vs direct drive) it handles clay without breaking a sweat. Very quiet as well. I like the fact that despite all that strength, its very light and I can easily pick it up, stick under my arm, and go. I’ve tried a Soldner tabletop model (made by Bluebird) and it was great.. sturdy and strong, but very heavy. Anyways, I was impressed not only by its ability, but by its exceedingly reasonable price. 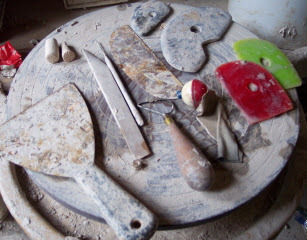 When you first start learning how to make pottery, you follow your teacher’s lead. You follow the same techniques, use the same tools, and emulate your teacher as best as you can. You take what you learn with you throughout your potting career. Lowell’s favourite thing to say to students as they start out is “First you learn the rules, then you learn there are no rules”. Sure, there are other ways to do the same thing, but as with learning a language, getting a good foundation in the fundamentals is important. Over time and with experience, we all come to find techniques, tricks, or tools that work better for each of us. Its always fun visiting other peoples’ studios. I’ve noticed over the years that no 2 potters work in exactly the same manner. And potters, while for the most part a kind and friendly lot, are pretty quirky. The longer they work alone in their studio, it seems, the quirkier they get too. …but that’s another post for another day! Right now I am throwing on an old Creative Industries wheel. I had been throwing on an even older Soldner wheel, up until August when, unfortunately, the 35 yr old motor finally bit the dust (hoping to repair it after this next show). The chair I use to sit at it is actually an old stool from a yard sale, cut to height. The front legs are cut 2 or so inches shorter than the back legs which makes it less of a strain on my back when leaning over to throw. A low-tech and inexpensive way to work smarter and save your back. – A straight sided 2 or 3 gallon water bucket – rim ideal for scraping excess slip off of my hands; clay particles settle nicely in bottom and don’t get stirred up each time I moisten my sponge. – bats – on the left side of the wheel table there is usually a stack of 7″ Creative Industries square bats that I use for smaller items. They have 2 sets of notches molded on the underside to fit different bat pin spacings for both this wheel and the Soldner. Also have 12″ & 14″ round CI bats, and a few Plastibats (which are actually superior, very sturdy and don’t bend, but are unfortunately more expensive). Nice thing about these plastic molded bats is they never rot and seem to last forever. The drawback is they are more expensive, limited in sizes (nothing more than 14″ in diameter). The Creative Industries ones have a tendency to bend when pots being taken off the wheel, so you have to be extra careful. 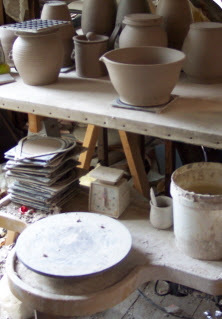 – a mirror – (not pictured) helps with seeing the contour of pots while both throwing and trimming. I threw for 2 weeks without one, bending to the side to see the profile, and not only did it kind of slow me down and make my neck/back hurt, but my pots looks different too. – big table – (the one pictured here is an old door on sawhorses with canvas stretched over it). I will throw a series and when the table is full, get up and move the pots to ware racks. – a 16″ square piece of plywood (very low tech) for trimming larger bowls and platters on.